Fun ideas for a My Little Pony Party! 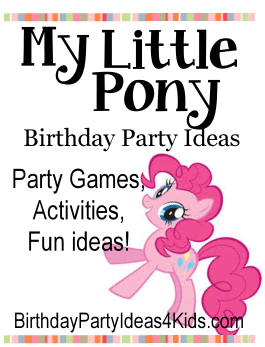 My Little Pony theme ideas for party games, activities, decorations, invitations, party food, favors and more! Set my My Little Pony figurines around the party as decoration. Let each of the guests take one of the figurines home as a party favor! Set up a candy bar using the colors of your birthday kiddo’s favorite ponies as a guide. Cut heart or flower shapes out of different colors of paper. Sew these shapes onto a thick piece of string to make a unique, colorful garland! For a variation on this idea, use colored balloons instead of paper cut into shapes. Cover the food table with a blue plastic tablecloth. Attach colored pom poms to gold pieces of ribbon and hang from the top of the table. Hang up colored tissue pom pom balls all around the party area! Hang up a light colored plastic tablecloth as a backdrop. Blow up white balloons and attach them to the top of the backdrop. Hang colored streamers or pieces of tulle down from the balloons for a decoration that wows! Make invitations of different brightly colored pieces of paper. Have your birthday kiddo decorate each invitation with My Little Pony stickers. Print out pictures of different My Little Ponies. Have the birthday guests try to guess which each pony is named. Blow up a picture of your birthday kiddo’s favorite pony and have the kids try to pin the tail on the picture. Make sure to blindfold them! Divide everyone into two teams. Give each person a plastic spoon and either a marshmallow or a jellybean. When the relay starts, the first person has to put the marshmallow/jellybean on the spoon and put the spoon in his/her mouth. Have them run to a designated spot (about ten or fifteen feet ahead of both teams) and back again. When the first person gets back to his/her team, the next person can go. The first team to have all of their members go and come back wins! Have the guests try to throw apples into a basket. Hang apples from the ceiling using string. Hang them so that they are the same height as the guest’s mouths. Once the game starts, have the guests try to bite the apples using only their mouths. They can help each other, but they are only allowed to use their heads! Have each guest try to guess how many jellybeans or gumballs are in a container when they arrive. The guest that comes the closest to the correct number gets to take the candy home! Supply each guest with butterfly wings and unicorn hats (party hats) to wear during the party. Designate an area of the party where guests can paint their fingers and/or toes. Make a tulle skirt for each guest using strips of tulle and elastic for the belt. Let the guests decorate their skirt with stickers, sequins, feathers, etc. Lay out colored beads and string for guests to make their own bracelets and necklaces. Buy several colors of temporary spray in hair dye. Let each guest choose what color they would like to put in his/her hair. Bubble blowing and dancing to music station! Print out pictures of different ponies and let the kids decorate them with markers, paint, etc. You can also supply each kid with blank places of paper and create their own pony. Display these around the party. Design a unicorn horn (party hat). Supply the necessary art supplies. Name the party food with different pony names, like ‘Applejack’s apple slices’ or ‘Fluttershy’s carrot treats’. Display different colors of rock candy sticks in jars. Arrange cupcakes in a rainbow formation. Ice all of the cupcakes in the outermost layer red, and the the next layer orange, then yellow, then green, then blue. Dip pink wafers, pretzel rods, and Rice Krispies into white chocolate and then dip into sprinkles. Make colorful fruit skewers on kabob skewers. Make rainbow colored cakepops and cover them in sprinkles. Give out stickers, nail polish, small My Little Pony figurines, pencils, and bottles of bubbles as party favors. Use brightly colored gift bags or sand pails as goody bags. You can also decorate white Chinese food takeout boxes with stickers. Ask a family member or friend to set up a face painting booth. Tell the guests to come dressed in the colors of their favorite pony.